It was a bright and beautiful sunny day over at Camp Harbor View. The kids were laughing and enjoying the sunlight that was emerging from the clouds. It was about 11 am, and we were with our last group of kids before we met with the fishing club. My coworkers and I were going around helping and teaching the kids how to cast a fishing rod. Most kids got the hang of it really quickly, but with our limited number of rods, we had to repeat the tutorial to the groups of the children. I headed over to a group of girls that looked like they needed some help. After I cast the line and began to reel it in, I felt a slight tug. As I reeled and reeled the line, I could feel the fish getting closer and closer to me. 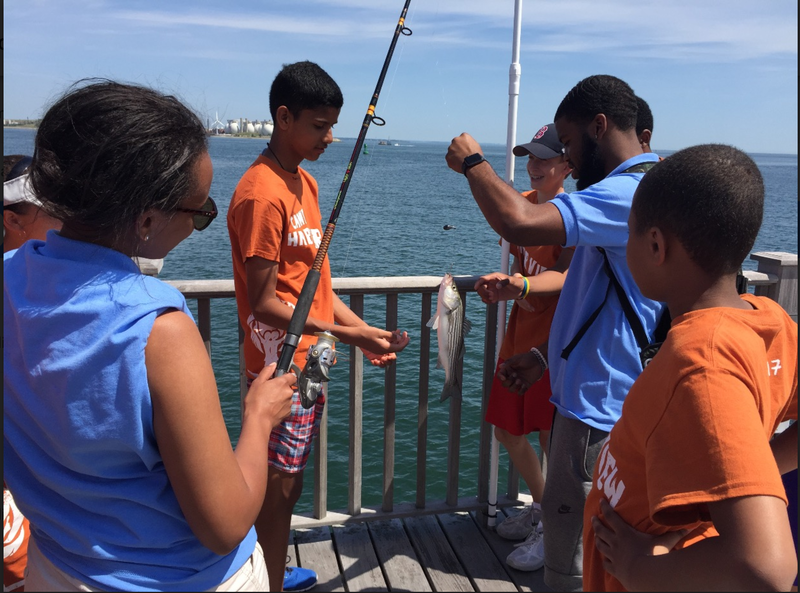 The kids were so amazed, and although the fish was not big enough to keep, there was a look of amazement on each of the campers faces. They were so excited that it was possible to catch a fish right there on their camp pier! After that every kid that walked onto the pier was determined to catch a fish. Not only was it my first time catching a fish, it was the first time I ever truly caught sight of the quick change in attitude of so many kids. Catch you guys next time on the harbor !